We arrived in Ella on the train in the middle of a monsoon, and in pitch darkness. After 7 hours gently chugging through the mountains with our legs hanging out the door of the carriage, waving at children in villages through which we passed, and feasting on fresh roti, samosas, pineapple and chai tea offered by sellers on the train, it was a minor shock to discover that we had a significant further journey into the mountains to our accommodation. Several people warned us of landslips on the road due to previous heavy rains, and as we climbed up and up from the village of Ella, with its lively backpacker bars and restaurants, we were uncertain where we might end up. The tarmac road eventually ran out, but to the consternation of our driver we ploughed on up a pot-holed dirt track, following hand-painted signs marking the way to the farm where we were scheduled to stay. We needn’t have worried. Dawn came, and another surprise in a country full of surprises awaited us. 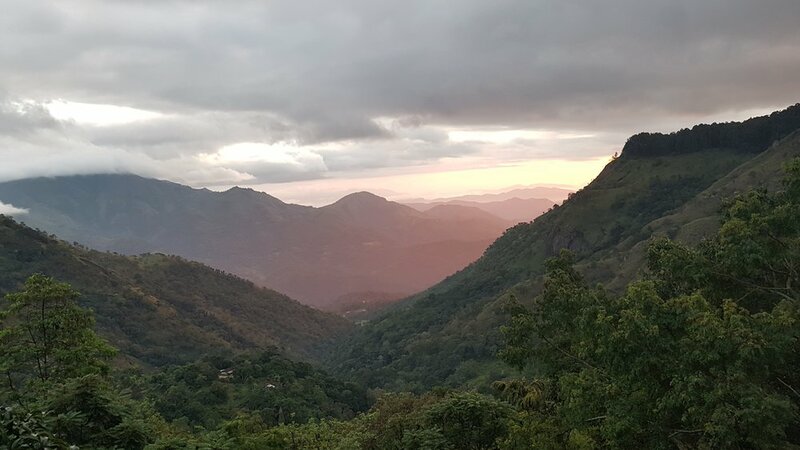 The view down the valley from our bed, through enormous windows, was breath-taking, and as with everywhere we had stayed in Sri Lanka, the welcome that greeted us was exceptional. Rajiv, the owner, told us stories of the colonial era and the tea plantations, his plans for the farm, and how the organic vegetables grown on the property were cooked into the exquisite curries we ate each day. He directed us on exhilarating, exhausting hikes to hidden spots, sent us to the best place to taste tea, and pointed out monkeys in the trees outside our cottage. Sri Lanka is often described as the ‘jewel of the Indian Ocean’, and the island entirely justified this description in our eyes. Ruined ancient cities, white sandy beaches fringed with palm trees, herds of elephants gently munching in the forest, Buddhist temples filled with exquisite carvings, plunging waterfalls amidst the tea plantations, blood-red sunsets over crystal clear waters and the myriad colours of silk and precious stones on offer; the contrasts of the country are outstanding. Since the end of the civil war in Sri Lanka, investment in tourism has resulted in a stratospheric rise in visitor numbers and enormous growth for this sector of the economy. The north of the island, ravaged by war until relatively recently and for many years off-limits to visitors, remains predominantly untouched but is now opening up. We travelled extensively during our trip, first to the Kalpitiya Peninsula where we found ourselves alone on a stunning beach, and then to Wilpattu National Park, where we saw few others whilst scanning the trees for leopards. It seems unlikely that this will be the case for long though. Surfers have been seeking out the isolated breaks in Sri Lanka for years, and the word is getting out to the rest of the world. There are eight UNESCO World Heritage Sites to explore, the friendliness of the people is unprecedented and they are proud of the delights their country has to offer. My advice? Get there before everyone else does.